Frida began work on a series of masterpieces which had no precedent in the history of art - paintings which exalted the feminine quality of truth, reality, cruelty and suffering. Never before had a woman put such agonized poetry on canvas as Frida did at this time in Detroit. 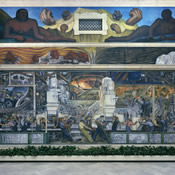 In April of 1932, the couple moved to Detroit where Rivera had been awarded a commission from the Ford Motor Company to paint a mural at the Detroit Institute of Arts. 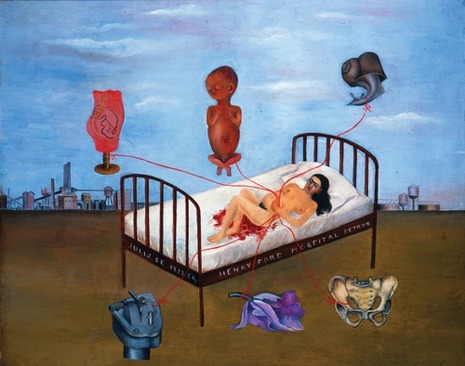 Frida became pregnant once again but after only three and a half months her second pregnancy ended in miscarriage at the Henry Ford Hospital. Diego never wanted children and Frida knew it. She took quinine in an attempt to abort, but it did not happen right away. In 1932 Rivera was commissioned to paint a major series of murals for the Detroit Museum, and here Kahlo suffered a miscarriage. While recovering, she painted Miscarriage in Detroit, the first of her truly penetrating self-portraits. The style she evolved was entirely unlike that of her husband, being based on Mexican folk art and in particular on the small votive pictures known as retablos, which the pious dedicated in Mexican churches.